September 25, 2013, the day that ORACLE Team USA defended the America’s Cup, was a momentous day in yachting history and the climax of the greatest come-from-behind victory in sports history. Larry Ellison’s team had been trailing the challenger with one point to New Zealand’s eight. The team rallied on San Francisco Bay, crossing the finish line first in eight consecutive races for the win. This “miracle on the water” had many in the event’s huge worldwide audience – longtime Cup watchers and new fans alike – wondering how they did it. 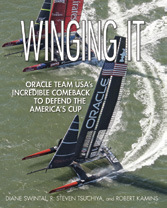 Co-authors Diane Swintal, R. Steven Tsuchiya and Robert Kamins – each a Cup expert – discuss the historic victory in terms that new yacht racing enthusiasts will find easy to understand, including insights from naval architects and boat builders on the radical design of the fastest match racing boats ever built, with explanations of how the AC72 catamarans’ rigid wing sails and hydrofoils work. Also included are conversations with sailors, including ORACLE skipper Jimmy Spithill and Emirates Team New Zealand skipper Dean Barker; several photographs by official event photographers, and a look at the history and future of Cup racing. Diane Swintal has written about yacht racing and auto racing for 25 years, covering the America’s Cup, the IZOD IndyCar Series and sports car racing. R. Steven Tsuchiya is a historian and freelance photographer specializing in the America’s Cup. A member of the America’s Cup Hall of Fame selection committee, he is a contributor to Sailing World and other yachting publications. Robert Kamins analyzed the America’s Cup for the OLN television channel and has been a contributor to CupInfo.com for 10 years. « Code Zero: The Cruiser’s Dream Sail? Code Zero: The Cruiser’s Dream Sail?